The following article first appeared on New Eastern Outlook. While doing the research I was amazed at the parallels of today, and during the world wars during which the Arab world was part of the grand strategy. In this piece you will detect the same common foes of peace; the bankers, the hegemonic elites and monarchs, all vying to subdue the world beneath their feet. You will see more clearly the enemies of peace profiting endlessly at our expense. I received a revelation at a strategy session the other day at our offices in Germany. Lebanon, Iraq, Iran, and Syria are still at war with the Axis powers of World War II! That’s right, refugees from the region are now streaming into enemy territory by the hundreds of thousands. Someone, maybe Vladimir Putin, has to broker a peace treaty, and soon. Not many reading this will know there are many nations technically at war still with Japan and Germany, as well as other Axis powers, technically that is. When the Allied nations of Britain, France, the US, and USSR assumed supreme authority over the German state in 1945, there was scant documentation of the exactitude of Axis powers’ surrenders and dispositions. For Germany in particular, it has been argued that the defeat at the hands of Allied nations was in fact a debellation, or obliteration by warring of a sovereign state. However, the nation’s identity is intact I assure you, even if it is by nature a vassal of Britain and the United States still. It is in this “technicality” we may find an apt solution to the chaos in the Middle East now, and in particular for Syria. Please allow me to explain. The killing fields we witness today in Syria and other parts of the Middle East are in reality part of an ongoing struggle for secular, tribal, and national independence. Since before World War I, the region has been at war with itself, and with what can be termed “westernization” of core Islamic beliefs. Without extending this piece into an historical study, it’s fair to say what we are witnessing is a “reenactment” of conflict akin to that during both world wars. World powers are leveraging the same ideologies, groups, and peoples that colonial powers have for generations. Cementing this fact is fairly easy, as luck would have it. All we have to do is outline past allegiances with those we see today, in order to galvanize the idea history is repeating. Let’s look at one group in particular, the Muslim Brotherhood, and the Obama administration’s backing of the organization through something called the Presidential Study Directive-11. To fully understand the significance of this, we need to understand the early foundations of the group, as well as the current status across the Arab world. The Obama administration acts out today, the same geo-strategic Machiavellianism past US governments have. Established in 1928 by an Egyptian schoolteacher named Hassan al-Banna, the Muslim Brotherhood grew out of the fundamental ideal of casting off so-called westernization. Most scholars would agree, the brotherhood came about in answer to the secular Young Societies organized by none other than the legendary T.E. Lawrence, better known as Lawrence of Arabia. It is the figure of the enigmatic Lawrence that delivers us to the current state of affairs in an around Damascus, Syria. As was the case back then, the “brotherhood” has been used to leverage imperial mechanisms. The deal ended up with the Rothschild’s and others funding Britain’s European war, with drawing the United States in, and ultimately with the Ottomans being carved up as suggested, right along with bashing Germany and Russia into the poor house of war torn creditors of these bankers. As we see today, Putin’s Russia is the only nation exempt from crippling national debt, but that’s another tale. Remember I lead into this story discussing a missing peace treaty in between Syria and Germany? This story tells of a world famous supporter of Arab independence and a little publicized proposed meetup in between Lawrence and Germany’s Adolf Hitler. Lawrence, like other veterans of World War I, detested the idea of still more war ravaging Europe. So it was Arabia’s most prominent western celebrity was killed in a political assassination on the eve of World War II. With this in mind it is important to take note of the fact that the Muslim Brotherhood was aligned with Hitler and the Nazis in World War II. Here we see the same colonial and imperialistic strategies progressing to today. The idea of a free and cohesive Middle East is ripped apart by the same old world power struggles yet again. On this line of thinking it seems pertinent today to remind the world of the so-called Syria–Lebanon campaign, also known as Operation Exporter, in World War II. This was the Allied invasion of Vichy French-controlled Syria and Lebanon in 1941. Back then western media was censored to reduce the negative affects the invasion might have on public opinion. This dynamic shows us, the ideals of T.E. Lawrence and others were greatly feared, just as they are to this day. The battle for Syria and Lebanon saw fighting in the same places we see ISIL, Al-Queda, so-called moderate jihadists and other “proxy” fighters killing one another today. The ancient city of Palmyra and many parts of Iraq were bloodstained until the Armistice of Saint Jean d’Acre basically turned Syria and Lebanon over to Britain. Syria and these other nations declared war on Nazi Germany afterwards, but there never was a cessation document officially signed in between Germany and these states. The British, Americans, French and Soviets probably deemed it unnecessary, but this is beside the point, Syria and Lebanon are sovereign nations. In his epic book on the Arab revolt during World War I, Seven Pillars of Wisdom, Lawrence describes the western betrayal of the Arab people, and the shift in his own beliefs. This account, via the Institute for Historical Review frame’s Lawrence’s transformation, and helps lay the groundwork for World War III we see playing out worldwide now. Lawrence knew back then, as some know now, our current Middle East crisis is all about fragmenting and weakening Arabs. The wars we see now are not even about Islam. Muslims are just an easy target and a convenient lever to escalate the conflicts in between peoples. The point of my revealing all of this, in particular the non-existent instrument of peace in between these Islamic nations and Germany, is that the real battle is and always has been the subversion of Arabia by western influences. Secondly, my purpose is to suggest a symbolic and meaningful treaty an author such as Bashar Hafez al-Assad might draft. Such a treatise between Syria and Germany may well help us forego trillions of dollars spent, and millions dead or displaced. On the former I’ll say this. The foreign policy efforts from Washington, London, and Brussels toward the Middle East have had absolutely nothing to do with the betterment of the people on the streets of those cities. This is fundamentally clear, as we see T.E. Lawrence’s greatest fears reenacted once again – and ultimate war is no friend of the normal citizen. As for the second point, here is my summary and suggestion. 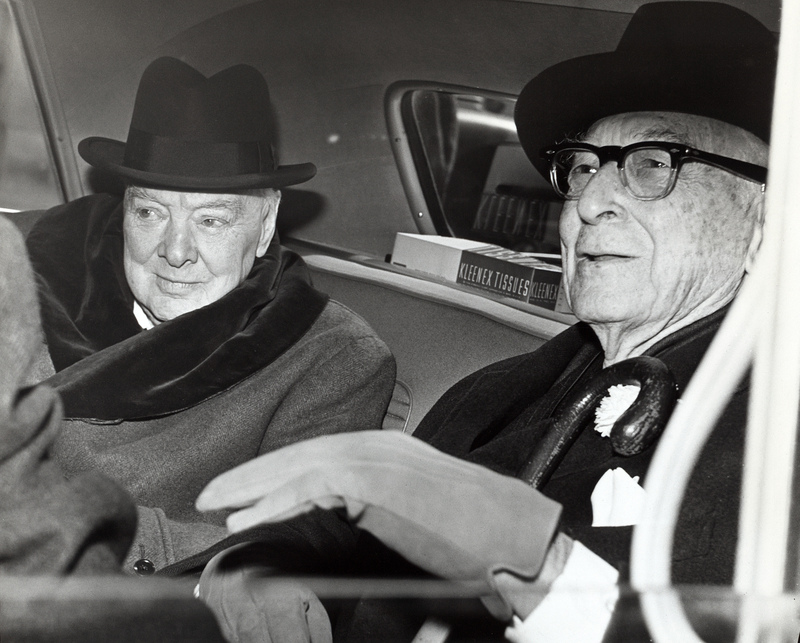 In World War I the Rockefellers and the head of president Willson’s War Industries Board, Rothschild banking agent and Zionist Bernard Baruch (seen with Winston Churchill above) each made $200 million off the war. A German reconnaissance aircraft aloft over Syrian territory right at this moment is flying over enemy territory. By any convention we know of, until hostilities in between any existent former Axis power have been officially decreed to have ended in between nations, then that state of war could technically still exist. A treaty now, in between Syria, Lebanon, Iran, Iraq, and other nations who’ve not officially signed such declarations accomplishes three very important functions. 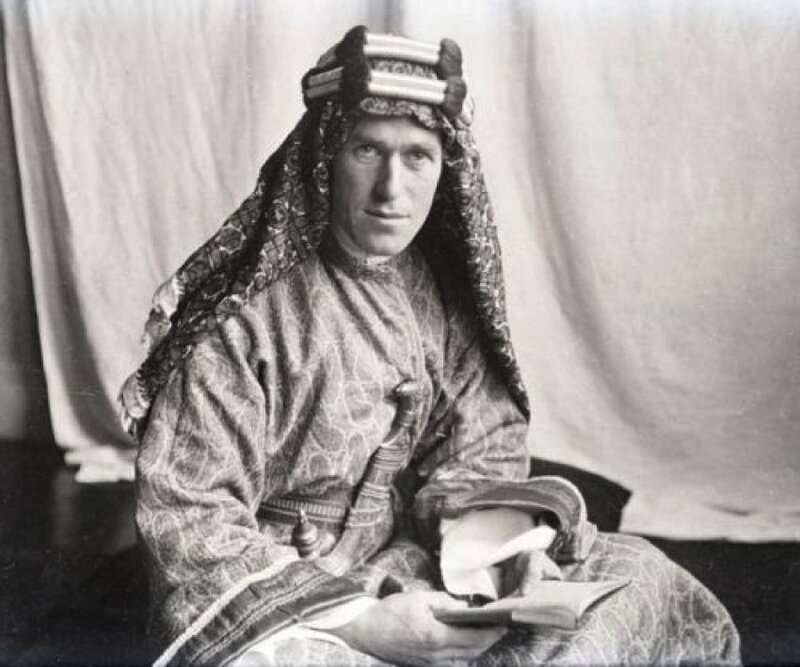 First and foremost, for instance, a Bashar Hafez al-Assad brokered “truce” in between these nations forwards the concept of Arabian independence T. E. Lawrence advocated. Assad as the catalyst would indemnify many Islamic tenants, and refute for millions the potential of a new Ottoman Empire, which some profess is in the works. Secondly, a treaty in between Germany and Syria in particular, would vehemently realign the western alliance strategy. Or in other words, dash any neocon or bankster play to destroy and fragment the Middle East further. Finally, and perhaps most significantly, the German republic finalizing the past and casting off the last vestiges of the Nazi legacy, would once and for all free the German people from the yoke of allied control. For make no mistake, Germans have been living in a vassal state without control or recourse, for over seventy years now. Even to this day vestiges of fear and mistrust impinge upon Germans as some sections of the UN Charter still cast the republic in a suspicious light. While some proclaim Chancellor Angela Merkel is simply a puppet of Washington, pen and paper decrees literally ensure the German state is still not independent. In short, an Assad brokered treaty would cement the notion Germany is a nation of free will. For some here in Germany, this sort of action would be well received. Most literate Germans might proclaim, “it’s high time” the nation was allowed genuine independence from the Allied powers. It’s high time all sovereign nations and people’s be granted the right to their respective freedoms. It is in these sorts of “technicalities” we find all of the chaos and killing going on in our world. Europe aligned in peace with Middle Eastern countries, and more importantly on the ideological side of Russia, equals world peace by the sheer magnitude of the proposition. Germany is one key to a resolute peace, for American and Britain alone stand no chance at hegemony alone. At least this is my theory. Thank you very much Phil. Thank you, Phil, for working out these historical schemes, that still form our present conditions. It´s high time, as you named it, that we draw our conclusions here and go for a change. Thanks for taking the time to comment Markolf. I would never have believed we would be reliving this history. It’s as if someone is replaying a record they enjoyed from the past. Perhaps the past perpetrators?